Switzerland is arguably one of the most beautiful countries not only in Europe, but the entire world. This mountainous nation is home to the beautiful Alps, modern and progressive cities filled with culture, beautiful lakes, and of course, all things luxury. Switzerland is known for their luxury goods and lifestyle, which is one of the reasons as to why it’s so expensive to live there. So if you’re visiting Switzerland and want to see some of the most luxurious places, where would you go? Here are ten of the best luxury locations that Switzerland has to offer. When people think of the stereotypical Swiss countryside, a place like Zermatt comes to mind. Zermatt is a small municipality in the southern part of the nation where they speak German, and it’s home to some of the countries most beautiful scenes. The town itself is surrounded by mountains, rivers, green grass, and the Matterhorn is close by. While it’s not filled with five-star hotels, although there’s plenty of luxury accommodations, it’s easily one of the most beautiful areas of Switzerland that shows off it’s serene nature. Lugano is a city in Southern Switzerland within the Canton of Ticino. The town shares a border with Italy, and it’s a part of the section of Switzerland where they speak predominantly Italian. It’s right on Lake Lugano and the town is often described as the “Monte Carlo of Switzerland”. Celebrities and VIPs from all over the world visit Lugano and with it’s unique blend of Swiss and Italian culture, it’s naturally quite a luxurious place. Licerne is a city located in the center of Switzerland, and it’s easily one of the nations most luxurious and most beautiful cities. Situated right on Lake Lucerne with the alps in the background, Lucerne has been attracting tourists for a number of years. The city has a medieval-European feel to it, and it’s famous for the Chapel Bridge that was constructed back in the 14th century. It’s charming, very Swiss, and has a host of luxury activities for you to do. Located in the Bernese Overland Region of the country, Interlaken is yet another iconic and beautiful Swiss town surrounded by gorgeous mountains. It’s a popular tourist destination for those that are seeking a luxury and beautiful experience within a fairly quiet Swiss town. It’s located perfectly near a number of hiking trails and ski slopes which makes it the ideal place for adventure seekers. Gstaad is an extremely haute and beautiful village in the southwestern part of Switzerland. The town is known especially for the various high-end ski resorts and hotels, and it’s a major travel destination visited by wealthy and affluent people from all over the world. It’s extremely charming, has some incredible ski slopes, and there’s plenty of luxurious restaurants and hotels to visit. Zurich is the largest city in Switzerland and it’s certainly one of the countries most luxurious destinations. You get the iconic Swiss charm from Zurich’s location and architecture, combined with everything a larger city can offer. So it still feels like a mountainous Swiss village located on a lake, in a sense, but one that has plenty of high-end restaurants, theaters, museums, hotels, and just generally more things to offer travelers. Geneva is probably the most famous city in Switzerland, and it’s arguably the most luxurious. Residents of Geneva enjoy an extremely high standard of living, the global city is a major financial and banking center, a number of international organizations are headquartered there, and it’s absolutely beautiful. If you’re looking for luxurious things to do in Switzerland, Geneva will never let you down as there is just so much wealth here. St. Moritz is one of Switzerland’s most iconic, beautiful, and luxurious alpine ski/resort towns. The surrounding mountains are home to some of the countries best ski slopes and St. Moritz is a popular destination visited by some of the wealthiest individuals in the world. When the celebrities and super rich want to ski in the alps, they come to St. Moritz. The city of Bern is considered the de facto capital of Switzerland, and it is yet another extremely beautiful and charming Swiss location. Established in the 12th century, this medieval town is home to historical buildings, cobblestone streets, beautiful homes, and much more. 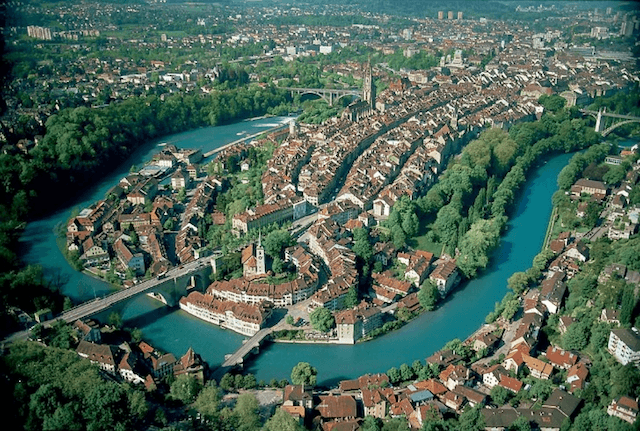 It’s unique location around the River Aare also contribute to the cities beauty. It’s the quintessential medieval European town that offers the finest of Swiss luxury. Since Lake Geneva is so large, it’s best to think of this region as separate from the city. In terms of luxury living, enjoying the finer things in life, and taking in the beauty of Switzerland, the Lake Geneva Region is a great place to visit. It is essentially the Swiss Riviera and it is home to iconic vistas, small vineyards, charming villages, and large private homes. Enjoy a glass of wine out on a small boat for the day and then return to your luxury boutique hotel for the night and eat some of the local fare. A trip to Lake Geneva and the surrounding area is one filled with luxury.